First Listen: Los Campesinos!, 'Hello Sadness' The U.K. band makes an ornery and quotable ruckus of the kind that could only come from seven talented brats clamoring to be heard over the din they create collectively. Hello Sadness, the new album from the U.K. band Los Campesinos!, comes out Nov. 15. 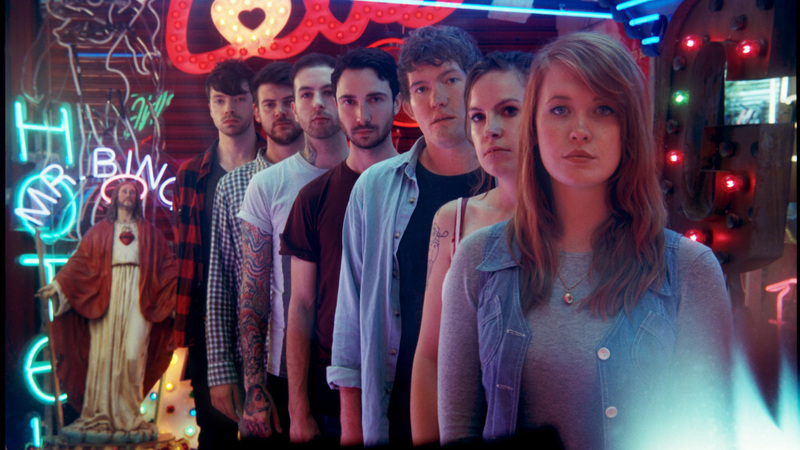 The U.K. band Los Campesinos! makes an ornery and quotable ruckus of the kind that could only come from seven talented brats clamoring to be heard over the din they create collectively. A single Los Campesinos! song can produce enough memorable lines to fill a dozen email signatures, provided it's possible to parse the words over singer Gareth's Welsh-accented mushmouth and the mad clatter that constantly threatens to drown him out. "By Your Hand," which kicks off Hello Sadness — the band's fourth full-length album in four years, out Nov. 15 — is full of salty zingers about hands in trousers and a lover who vomits down the front of the protagonist's rental tux. Conflict rages on and off through the song, with Gareth proclaiming this "a good night for a fistfight," but the ever-escalating cataclysm that accompanies it is pure joy, complete with shout-along choruses. From there, Hello Sadness does a bit more effective job periodically living up to its morose title. Los Campesinos! isn't exactly new to the art of documenting relationships in shambles (this is the band that once shouted in unison, "Oh, we kid ourselves there's future in the f---- / but there is no f---- future," in a song called "We Are Beautiful, We Are Doomed"), but the mood gets more downcast as Hello Sadness rolls on. The result is a surprisingly diverse breakup album that examines the many vivid moods stemming from love's implosion, from the titular sadness to rage to resignation and back again.